Time to look at another great photography gift, the Spyder Cube. This handy cube will help you set black and white points in your image as well as accurate colour by providing 18% grey white balance targets. In the video I explain how it works and how to use it with an image in Lightroom. Monitor calibration is critical to a good photography workflow so in today's video review we take a look at the Spyder 4 Pro monitor calibration tool from DataColor. You know those clear plastic wrappers Apple use on their products that are so fantastically fun to open? Apple are masters of turning a simple unboxing into a special event. It seems Moo are reading from the same playbook. They've always taken great care over the presentation of their products but never more so than with their new Luxe business cards. 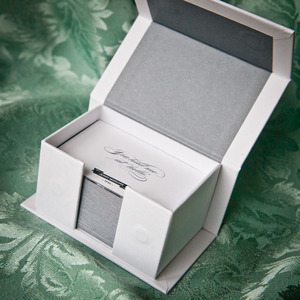 The cards themselves come in an elegant little box with magnetic closures. 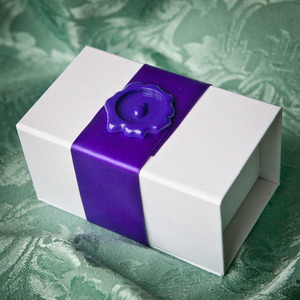 That's wrapped in a purple ribbon fastened by what looks like a stamped wax seal. All of this is enclosed in a card wrapping designed to present a neat "lid" as you open the posting box. This attention to detail is what raises Moo above the competition. Moo understands that you're excited about getting your new cards, especially if they've got your photographs printed on them. Their presentation makes that little moment of unboxing even more enjoyable - so much so that you find yourself unwilling to actually give the cards away for fear of spoiling this pristine little shrine to your new cards. In fact the genius of Moo is not just in the presentation of their product. This is the company that started out offering just minicards which were a strange shape and on fairly thin card but with the ability to put a different image on the front of each one. They weren't business cards and they weren't prints. It's hard to say what they actually were besides insanely desirable. What Moo do best of all is design *great* products. Their product range has always been limited but with each piece carefully chosen for paper quality, print process, lamination and presentation. They don't try to make everything but what they do make is *good*. Reading from the Apple playbook again then. Buying from Moo is a pleasant experience from beginning to end - enough to make up for the fact that they're actually quite expensive. And Luxe cards are at the ouch end of even that curve. What you get are business cards printed on a fascinating new triple layer paper with a stripe of colour sandwiched between two white layers. This new paper is very stiff and has a matte finish which is much easier to write on than Moo's usual laminated cards. The matte finish does mean that blacks don't print very dark, though. My own black and white designs have very strong contrasts but came out looking lighter than I would have liked - a common problem with matte printing. Overall, though, the quality of Luxe cards is absolutely up there with what I've come to expect from Moo. 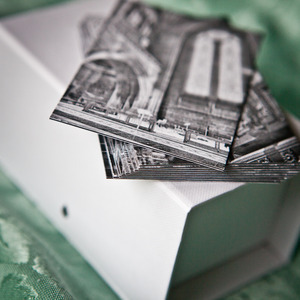 Where Moo's minicards or business cards are a great opportunity to show off your photography, Luxe cards are better suited to being actual business cards, especially if you want to wow people with quality. Moo Luxe business cards are £23.99 or $34.99 for 50 cards and you can find out more at moo.com. Today we look at Snapheal for the Mac, a brand new app by Macphun software for editing your photos and in particular for tidying or removing distracting elements. Snapheal reproduces and improves on the content aware fill feature of Photoshop and also has clone stamp, exposure, cropping and selective adjustment features. It's very affordable at its launch price of $9.99 through the Mac app store. Today we've got another free video tutorial featuring Color Efex Pro 4 from Nik Software. This multi-part tutorial will cover a variety of filters, old and new show and ways to use them creatively to take an image from the original camera RAW to a finished version ready to print.